Soldiers of the 2nd Infantry Division's Company B, 5th Battalion, 20th Infantry Regiment (Stryker Brigade Combat Team), conduct a patrol in Samarra, Iraq, in December 2003. Deployed to: Soldiers and equipment began arriving in Kuwait on November 12, 2003. The brigade crossed into Iraq on December 3, 2003, and conducted sustained operations in Duluiyah and Samarra while attached to the 4th Infantry Division. In January 2004, the brigade began moving to bases in and around the city of Mosul in northern Iraq. Units: The brigade is made up of the following battalions: 1st Battalion, 23rd Infantry Regiment; 2nd Battalion, 3rd Infantry Regiment; 5th Battalion, 20th Infantry Regiment; 1st Battalion, 37th Field Artillery Regiment; 1st Squadron, 14th Cavalry Regiment; C Company, 5th Battalion, 5th Air Defense Artillery Regiment; 209th Military Intelligence Company, 334th Signal Company; 18th Engineering Company; 367th Maintenance Company; and the 296th Forward Support Battalion. Duties: The brigade is reinforcing the 1st Infantry Division in northern Iraq as part of the Multinational Brigade-North that will relieve the 101st Airborne Division. The brigade is the first Stryker Brigade, fielding the Army's new Stryker armored wheeled vehicle. 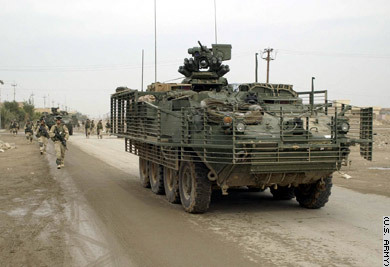 The vehicle is designed to enable the Stryker Brigade Combat Team to maneuver more easily in close and urban terrain while providing protection in open terrain. The brigade is made up of three infantry battalions, a reconnaissance squadron, an artillery battalion, a support battalion, a military intelligence company, a signal company, an engineering company, an anti-tank company, and the brigade headquarters.